Aiyana Jones and her three little brothers were sleeping at their grandmother’s home when police raided, killing her with a shot to the head from an MP5 machine gun. 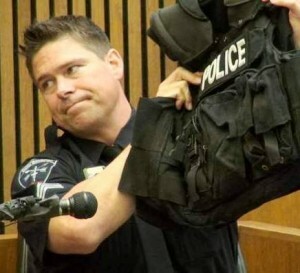 DETROIT – Testimony continued June 5 and 6 in the trial of Detroit police officer Joseph Weekley, charged with involuntary manslaughter and reckless use of a firearm resulting in the death of Aiyana Stanley-Jones, 7, in 2010. Once again, both Prosecutor Robert Moran and Weekley’s defense attorney Steve Fishman ignored the central issue in the case—the military use of police against poor Black Detroiters, which was bound eventually to result in such a tragedy. 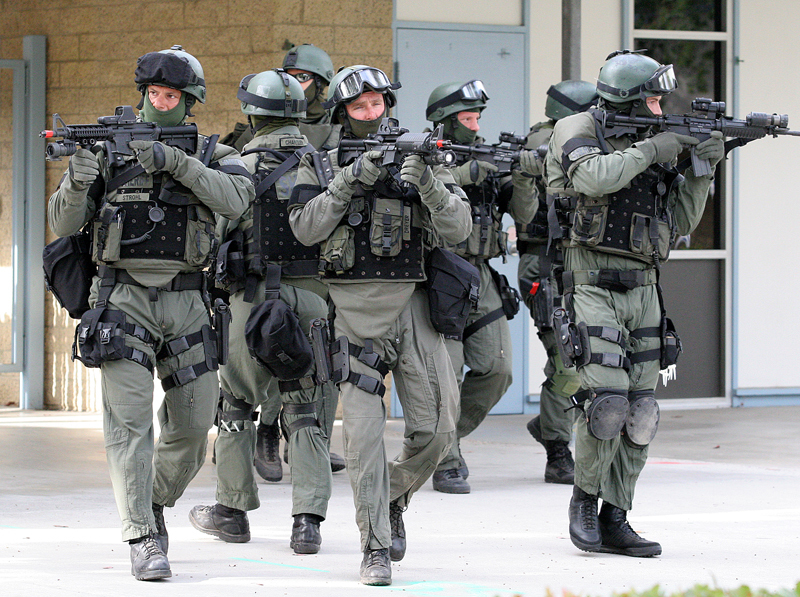 At one point, Special Response Team (SRT) Sgt. Tim “Malibu” Dollinger called the post-midnight raid on the Jones home, where four little children were sleeping, a “mission.” The term recalled civilian killings by U.S. military forces in Iraq and Afghanistan. Aiyana’s cousins Mark Robinson and Vincent Ellis and her aunt LaKrystal Sanders took the stand to describe the horrific raid. Her grandmother Mertilla Jones, who was sleeping on the couch with Aiyana when Weekley shot the child through the head using an MP5 submachine gun, is set to testify Mon. June 10. Expert depiction of Aiyana’s killing by Weekley, as presented by family’s attorney Geoffrey Fieger. It is likely that Fishman will grill her about his primary defense of Weekley, that she bumped into his gun or otherwise interfered with him. Most raid team members so far have testified that when they entered the home, Mertilla Jones was on the far end of the couch, a significant distance away from Weekley. On June 5, Robinson, 22, said he had gone outside to get his two puppies back into their pen after Ellis woke him shortly after midnight June 16, 2010. SRT raid team member Kata Ante Taylor. 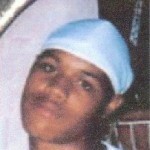 Artell Dickerson, killed by Taylor. He said afterwards he saw the police bring his aunt, Mertilla Jones, out of the house in handcuffs and take her away in in a police car. The officer who carried the child out, according to police testimony, was Kata’Ante Taylor. He executed 18-year-old Artrell Dickerson with two gunshots to the back as he lay on the ground in 2008, according to eyewitnesses. Dickerson’s family won a $1.5 million settlement against the City of Detroit in that case. Fishman asked whether Robinson knew and told family members that Chauncey Owens, who lived in the upstairs flat with LaKrystal Sanders, was involved in the killing of Je’Rean Blake, 17, on May 14, 2010, the motive for the raid. Robinson said he suspected Owens or Owens’ brother Sherron Heard, known as “Chinaman,” might have been involved because they had a moped, cited in TV reports as present at the scene of the Motor City Marketplace liquor store where Blake died. But, he said, he did not know if that was the case and never told others in the family of his thoughts. He said the killing did not fit Owens’ personality. “It was not my place to ask him,” he said. He testified he had never seen Owens with a gun. 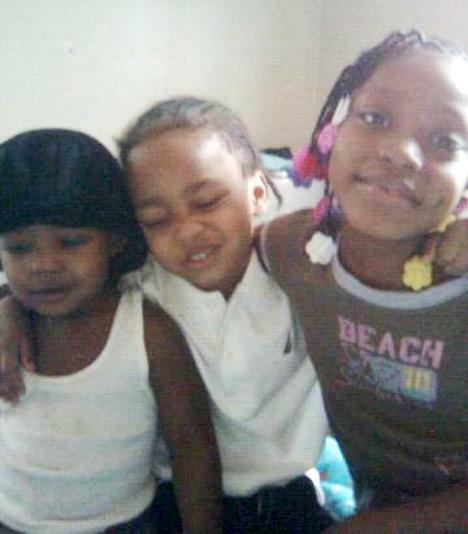 Earlier, police testified that no weapons were found in the house after Aiyana was killed. Moran is also prosecuting Owens and Aiyana’s father Charles Jones in the Blake case in what many have called a conflict of interest. 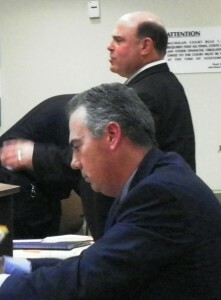 Both he and Fishman elicited testimony from police officers that they “heard” Owens had a handgun and an AK 47. However, the officers never specified who gave them the information or whether they had seen the weapons. Neither Wayne County Circuit Court Judge Cynthia Gray Hathaway, who is hearing the case, nor the prosecution has objected to such presentation of “facts not in evidence,” although Hathaway at one point objected to “hearsay” but did not rule it out. Police on the stand and in an A & E videotape have said but not substantiated that Lillibridge, the street where the Jones family lived, was a hot-bed of drug dealing, and that Owens dealt drugs. They appear to be playing to the sentiments of the jury, which is all-white except for one Black member. Owens has no drug-related convictions on his record. Toys in front yard of Aiyana’s home in photo taken May 16, 2010 are the same ones seen in evidence photo shown to police and jury in Weekley trial. Photo by Diane Bukowski. Likewise, Judge Hathaway has not challenged Moran and Fishman’s continued characterization of Owens as a “murderer,” although he has not yet been tried in Blake’s death, and has no other murder-related convictions on his record. 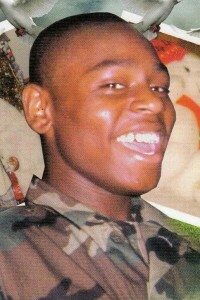 No arrest warrant was issued for Owens until May 19, 2010, three days after the raid, according to court records. Instead, officers testified, they obtained a “search warrant” for the two-family flat where the Jones family lived downstairs, running it to 36th District Court Magistrate Sidney Barthwell’s home for a signature just prior to the raid. Barthwell arraigned Maryanne Godboldo nearly a year after Aiyana’s death, after she stood off a similar SRT raid by police who were trying to take her daughter Ariana to medicate her with a dangerous drug in March, 2011. He ordered Godboldo held on a half-million dollar bond, until an outpouring of national support forced her release on personal bond. 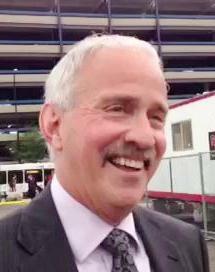 Later, 36th District Court Judge Ronald Giles dismissed all charges against Godboldo. Many community members have contended the SRT team wanted to put on a show with their military gear for the A & E TV cameras, which had been following the investigation all day, by raiding the house instead. Sgt. Timothy Dollinger headed raid team. After ignoring them during the first days of testimony, Moran finally pointed out the numerous brightly-colored toys in the family’s front yard, which are clearly visible in an evidence technician’s photo of the home, shown repeatedly to officers and the jury. 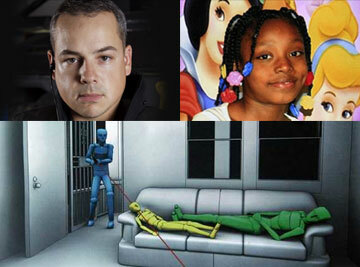 All the officers denied seeing the toys during extensive surveillance before the raid. SRT Sergeant Tim “Malibu” Dollinger, who along with Weekley, nicknamed “Brain,” is featured as a star on A & E’s “Detroit SWAT” website, was in charge of the raid team. After testifying extensively about the line-up of the SRT raid team as it entered the house, and the gear they wore, Dollinger said he was the third or fourth officer inside the home, and immediately saw an entry bullet wound in Aiyana’s head. He said he directed Officer Taylor to take her out, and continued to search the home on all three levels. He testified that he drove by the house beforehand with Weekley and another SRT officer. He denied seeing the toys, and said knowing that children were present would not have changed the team’s plan. “Is the fact there are children in the house, does that mean a murder suspect can sit around with children for the next 10 years and the police will never come get them?” Fishman asked. He testified that he and Weekley had participated in at least 250 search warrant raids and about 50 “barricaded gunman” raids. He said SRT officers get a “patch” for their uniforms for each raid. Rally for Justice for Aiyana held March 8, 2013. Aunt LaKrystal Sanders is in center. Dollinger said he was born and raised in Detroit by his grandparents, and that he and his grandfather were both victims of robberies. He said that motivated him to become a policeman. Dollinger currently lives in New Baltimore, Michigan, according to an on-line records search. Aiyana’s aunt LaKrystal Sanders, who lived with Chauncey Owens for 17 years at various residences, also testified June 6. Sanders said she and Owens heard the loud noises and came down from the upper flat as police were breaking down their door. Police arrested Owens, who was in his boxer shorts, and took him into the lower flat, she said. Her testimony cast doubt on the prosecution’s case against Owens. Fishman quoted testimony she gave to a grand jury regarding the day Blake was killed. 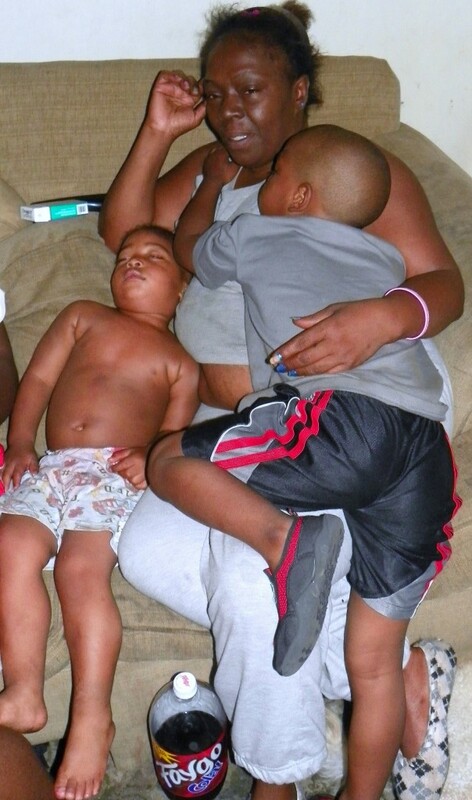 Mertilla Jones with her grandchildren after second police raid on her home in 2012, late the night of a hearing in Weekley’s case. Sanders said “Chinaman” had only relayed that information to his brother. Earlier, Fishman blamed Aiyana’s mother for letting her children stay in the same house with Owens after allegedly hearing of his involvement in the Blake killing. However, the transcript Fishman read clarified that it was not Dominika Stanley, but Dominique Simpson, the mother of Jones’ other children, allegedly on the porch. Simpson and her children were not in the house during the raid. Aiyana’s cousin Vincent Ellis also testified June 6. He said he was in a front befroom when he heard commotion and noise, and started to go into the front room, but fell back into his room when he saw the flash of the grenade. He said he heard another loud noise. Fishman also asked about Ellis’ testimony to the grand jury that Mertilla Jones told him she was on the couch when Aiyana was shot. 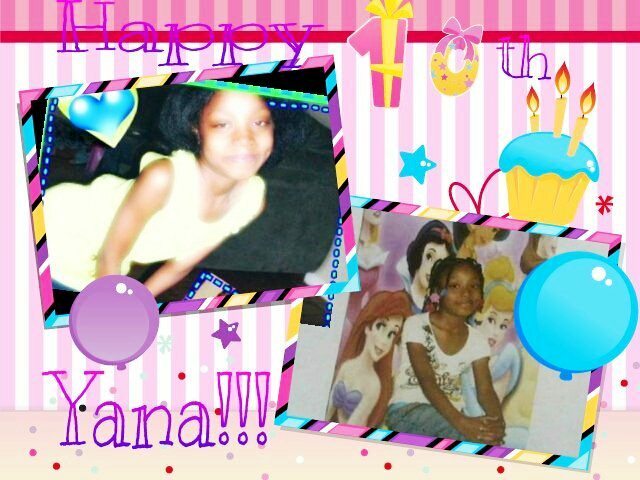 Aiyana would have been 10 last year. Photo from family’s Facebook page. Fishman had made an issue of that several times, since Jones on has said she fell to the floor when the grenade, which was found under the cushions of the couch by the evidence unit, went off. He likely will grill her June 10 on her differing testimony. Jones was held for several days by police after watching her grandchild shot to death in front of her eyes, has been in poor health, and is likely still suffering from post-traumatic stress syndrome. Members of Aiyana’s large extended family from both her mother’s and father’s side have attended the trial every day and expressed anger about evident attempts to blame the child’s death on people in the family. 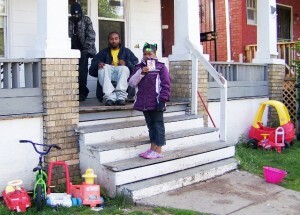 The military-style methods promoted by Detroit’s police chief have come under fire since officers shot and killed a small girl last month during a botched house raid that ignited public outrage. Chief Warren Evans took over the police department there last year and embarked on an aggressive campaign to win back the city from its stubbornly high violent-crime rate by among other things dispatching a so-called Special Response Team for everyday law enforcement activities. The unit’s members dress in intimidating SWAT attire and carry submachine guns capable of unleashing an extraordinary 800 rounds per minute. At least that’s how their firepower is described on the website of “S.W.A.T.,” a television program hosted by the cable TV network A&E that showcases Detroit’s elite law enforcement team alongside two others in Dallas and Kansas City. Elevated Risk previously asked whether the tragedy that exacerbated already deep fissures in Detroit between the black community and police also showed that local law enforcement in the United States had become overly militarized since Sept. 11. Time magazine answered that question in part by later reporting that the techniques Evans preferred for turning around Detroit were backfiring and Mayor Dave Bing had publicly declared the city would be “reigning him in.” . . . . The police department’s leadership is now under a microscope following last month’s killing. The Detroit Free Press on June 6 reported in depth on another unit in the agency known as the Mobile Strike Force that openly turns even the smallest infractions – including jaywalking and loitering – into a search for drugs and weapons. “In a city where an average of three people are shot every day,” the paper wrote, “Chief Warren Evans said the only way to combat guns is to get the illegal ones off the street. If that means stopping people breaking minor laws, he said, so be it.” Inevitably, that’s led critics to accuse the police of profiling citizens and relying on tactics better suited for Baghdad. Meanwhile, the increased use in Detroit of its SWAT team parallels an ongoing trend nationally of police departments seeking to emulate the armed forces. Many officers are in fact reservists who fought in Iraq and Afghanistan. A flood of federal homeland security grants awarded by the billions since 2001 has further encouraged this new look of local law enforcement, enabling police agencies to buy armored assault vehicles, muscle-bound RVs known as incident-command trucks, beefy tactical body armor and battering rams. The man identified as having fired the bullet that killed young Aiyana Jones during a “no-knock” raid, Officer Joseph Weekley, still appeared on the website of A&E’s “S.W.A.T.” when Elevated Risk first wrote about the subject May 26. He continues to be featured on the site today. Weekley poses grim-faced in the photo and handles a hefty-barreled “multi-launcher” that shoots “less-lethal rounds” designed to halt unruly crowds or suspects without anyone getting killed. He’s a lead driver of the unit’s armored personnel carrier, the site says. Detroit is not the only city to go the paramilitary route. Since the 1980s drug war, experts say, many local police departments have developed such units, often with surplus U.S. military gear. Initially, the units responded to hostage situations. Increasingly, they’re used proactively to search for illegal contraband, like guns and drugs, says Peter Kraska, professor of criminal justice at Eastern Kentucky University and author of Militarizing the American Criminal Justice System. Local police have a fundamental mission: to use the minimum amount of force to bring criminals to justice. That’s a very different mission from that of the military: to destroy the enemy. 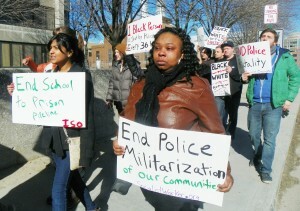 Detroit also isn’t the only city where special weapons and tactics squads are being scrutinized for their conduct. Just this week in Columbus, Ohio, city leaders announced that they wanted to know more about a mask-wearing, non-uniformed group of local police officers who leaped out of unmarked vans during a traffic stop. Police searched the car and its two occupants explaining later that they believed it was stolen. But the driver reportedly turned out to be a teenage boy who’d just picked up his father from work during the early morning hours of May 7. The youth’s pants were allegedly pulled down during a search for drugs and weapons. Officers present were later identified as part of the local Strategic Response Bureau, which, according to the Columbus Dispatch, “often operates undercover to gather intelligence, investigate gangs and handle other special operations.” At the time, they were “dressed in black fatigues, and some wore masks. Neither father nor son saw badges, but one of the men wore a ball cap with the word police.” The incident is also being investigated by internal affairs, the Dispatch reports. It’s truly a great and useful piece of info. I’m happy that you shared this helpful info with us. Please stay us informed like this. Thank you for sharing.